NEXT MEETING: Tuesday, October 6, 2015, 7 pm. Old Car Garage at 3232 Girard Blvd NE. Program to be Ford Videos. Refreshments by Al Seery and Jan Rothell. BREAKFAST GROUP: Saturday, October 17, 2015, meet at 8:30 am, Smiths at Tramway & Central, to travel to Moriarity. Saturday, October 17th we will be meeting in the Smith’s parking lot at Tramway and Central at 8:30 am. We will then caravan to Moriarity where we will enjoy breakfast at KC’s Restaurant followed by a tour of Lewis Antique Auto and Toy Museum (assuming schedules fit). Archie Lewis has quite a collection. Weather should be delightful for driving our cars. Hope to see you there. Clearly I did not pick this picture! Beth was tired of waiting for me to jot a President’s note so she picked the photo and told me to get busy. Whew, frankly I thought I have been busy and the photo shows a brief respite. Nevertheless we go on. I am not going to say October will be another good month for club activities because it will be a GREAT month. We’ll start with our normal lively club meeting on October 6th –bring popcorn, Joe has videos. Then breakfast is coupled with a drive on the singing highway and hopefully a tour of Archie Lewis’ museum on Saturday October 17th. To cap a great month Jay arranged a tour of the Wheels Transportation Museum on Halloween October 31st. He assures us we will be home to treat the little monsters in the evening. Further to my claim of a great October, the nominations committee will announce their projected officers for 2016 at the October meeting. I hope we all look forward to a rip roaring primary contest between the nominees vying for our vote at the November meeting. So goes October; goblins and contestants, meetings and tours, all brought about by Henry Ford and our special cars. The meeting was called to order by President Jeff. We had seven guests present: Lori and Jeff Rector, Gail and Clyde Bangiola, Kenny Campbell, Ed Sauer and prospective member Scott Fliegel. The minutes of last meeting were approved. Treasurer D.J. reported that the club has a balance of $4705.85 with $1396.01 in savings. Lori Rector, the new President of NM Council of Car Clubs talked to us about her vision for the council; condensed meetings, participation of more car clubs and an updated website (nmcarcouncil.com)and Face book account. She also told us the primary fundraisers for the car council are the spring Museum Car Show and the upcoming Los Lunas Swap Meet. Old Business: Thanks for refreshments to Ross Collord and Jay Hertz. Gary McGlasson provided the recipe of the month for September, a delicious cornbread. He selected Beth Jackson to do the October recipe and requested her meatloaf recipe. Jeff reported that the website costs $190/year and is up for renewal in October. Recent statistics are an average of 7 visits a day and each visitor reviews on average 14 pages. We will vote on the status of the website next meeting. The group that attended breakfast at Monica’s El Portal reported a good breakfast except for Frank who was somewhat unhappy with his food. Jay gave a status report on his Club Purpose committee. They met and came up with several ideas. They are still looking for ideas from others before they make a recommendation. New Business: The September breakfast will be Saturday, Sept. 19th at Furr’s Fresh Buffet on Wyoming. Meeting time is 8:30am and this location was chosen by Jay. The October breakfast will be on Saturday, October 17th and will be held in conjunction with a tour to Archie Lewis’ Museum in Moriarity. The V-8 Club Day at the State Fair is Sunday, September 13th. Club members will meet at 7:30am at the Caravan East parking lot to enter the fairgrounds together. September is the month to select a nominating committee to put together a slate of officers for next year. President Jeff appointed Max Glover, D.J. McAlister, Vern Willan and Bob Payne to the committee. They were charged with presenting a slate of officers at the October meeting. Guest Gail Bangiola, board member of the Ford Foundation, told us the Ford Foundation Museum is being expanded. $150 donation will pay for 1 sq ft of the new building. Gail and husband Clyde were on the return trip of their drive from Cottonwood, Arizona to Auburn, Indiana in their 1940 coupe. 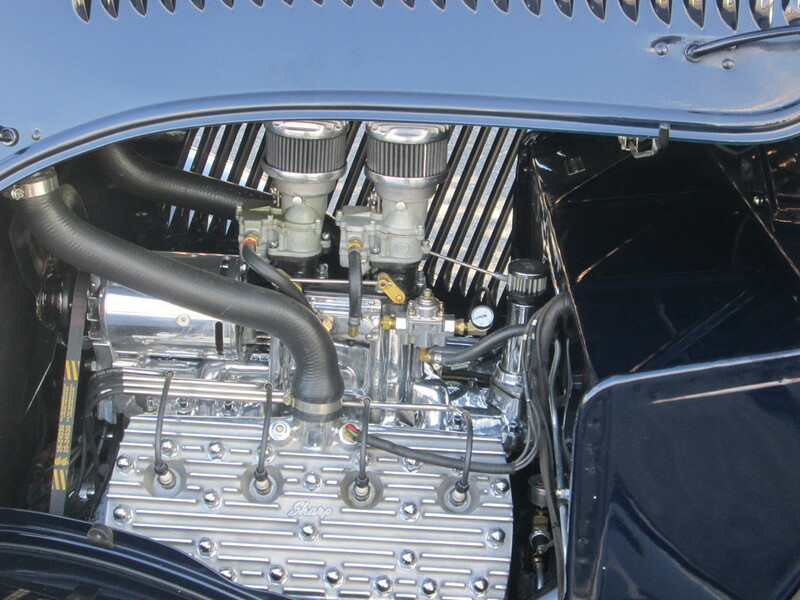 Lou Mraz of a Colorado V-8 club has sent information to our club concerning a national tour their club is leading around Southern Colorado in September 2016. More info will follow. Jay announced that he has contacted the Wheels Museum and arranged for a tour for our club at 10am on Saturday, October 31st. The Museum is located on the grounds of the Old Rail Yard on First Street. The tour will be led by the President of the Museum, Leba Freed. The group will eat lunch nearby after the tour. Thank you, Jay, for making these arrangements. For Show and Tell, Jeff brought a plate with a picture of the Ford Rotunda on it and a spoon from the Ford Cafeteria. D.J. brought a Hagerty magazine, Ray brought some pictures and Art brought a “2 spline starter bendix” to talk about. Refreshments and camaraderie were enjoyed by members and guests followed by a very interesting talk by our own Joe Abbin on Gas Mileage in Early Fords. Salt, pepper, garlic, Worchestshire sauce, soy sauce, basil, oregano, rosemary, ketchup and mustard. Mix well and form a loaf in a loaf pan. Squirt ketchup on top. Bake at 350 for approximately one hour or until done. The Clements drove the 1949 Tudor to Motorfest VI in Auburn. There we joined about 50 other V8's and some modern iron for the event. The trip there was very pleasant, weather-wise – temps in the 80's and low 90's made for nice driving in the V8. The only delay we had was about a 60-mile detour from Yates Center to Iola, Kansas, due to a bridge being out. We got to see parts of Kansas we had not seen before – look on the bright side. In Auburn, we were welcomed by many Foundation members and fed cookies and other snacks. Our goodie bag yielded lots of trinkets and plenty of suggestions for things to do. One event was the small swap meet that had few vendors but lots of goodies that you don't find at ordinary swap meets. We bought some paper memorabilia and a promo 1940 Mercury bank. Jerry Vincentini, emcee at the welcome party took bids, for places in the buffet line, and he raised a couple hundred dollars for the building fund. It cost our table $22 for sixth place, and we were not the last in line by several tables. We toured to Kalamazoo, Michigan, to see the Air Zoo. They have a number of restored and flying biplanes and WWII fighter planes. We got a tour of the restoration shop where they are starting work on a Wildcat fished out of Lake Michigan after 70 or so years on the bottom. And we think we've got problems fixing a Ford. That trip was well worth the visit, as we saw many restored aircraft, mostly of the WWII era. We had a show and shine around the city square. The show included a completely original Model T, a really nice original Corvair, several Model A's, and two open Auburns. A wide variety of cars were there, along with our V8 Fords. At the NAPA store while seeking a headlight and a radiator hose, we parked next to an L-29 Cord buying parts. We visited the Military Museum, which has lost a lot of its unusual vehicles, due to some poor financial decisions by Kruse Auctions. The Foundation Museum has added vehicles, parts, engines, advertising and general memorabilia. It is bursting at the seams. The current plan is to double the size of the building to hold more stuff. Square feet of the new building are being sold for $150/square foot. A number were sold at the meet, and with the auction of a few items at meals, about $10,000 was raised toward the project. The land is purchased, and the building is on the drawing board. You can find out the details on the Foundation web site. The mayor of Auburn was a guest speaker at the farewell dinner at the local country club. After the meal, there were more speeches and auctions of goodies to raise money. We saved money here by being outbid on a couple of neat items. After lots of farewells and good wishes, we headed home. The car gave us no trouble except to burn out a headlight in Illinois and develop a slight leak around a lower radiator hose. Strangely enough, while on the way home through Missouri last year, the front end of the speedometer cable snapped. We replaced it, and this time on the way home through Missouri, the rear end of the speedometer cable snapped. Moral – stay out of Missouri. Sunday, September 13th, was a lovely day for the State Fair. We had eleven cars participate and several members did an excellent job talking with the crowd and inviting new interested people to visit our club meetings. We departed the Caravan East gathering location right on time despite taking a few minutes to “push off” Ron and his ’34. Joe and Beth both submitted pictures and we will include several in this newsletter. 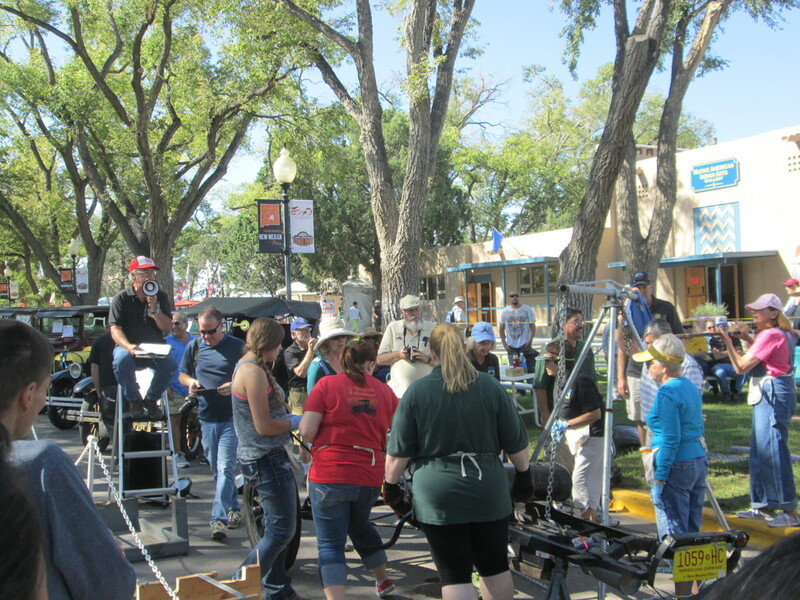 In one of the pictures below you’ll see The Tin Lizzies had a group of women assembling a Model T. Our member Larry Azevedo is on the ladder directing and explaining the ongoing to the crowd while his wife Lorna is helping assemble. At the end of the show the police and security did a fine job of clearing the streets and moving us all out safely. It was decided all the cars looked so fine that no internal awards were given. Everyone received a participation ribbon. There is a proposed National Tour for September 2016. It will tour southern Colorado and Eastern Utah. It is proposed for 5 days with distances between 50 and 225 miles per day. We will discuss locations in more detail at the meeting. They are looking for feedback from us. Tuesday 6th Club Meeting 7pmProgram is Ford Videos. Refreshments by Al Seery & Jan Rothell.